Total Length 13 inches approx cutting edge 4 inches approx handlae made of MICARTA SHEET. 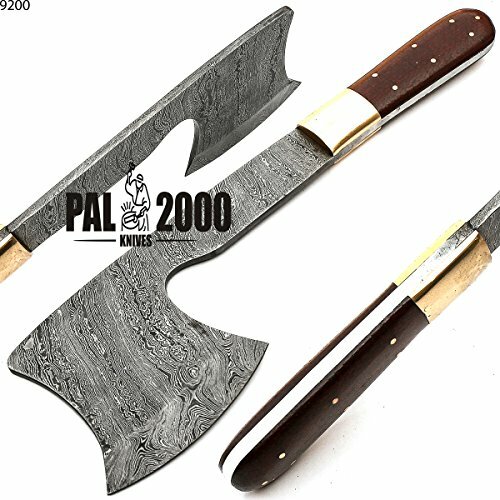 ***** this AXE come with stunning damascus steel blade model produced from 1095 / 15N20 alloy steel (352 true layers) in beautiful hand-forged models. damascus this AXE has high quality content to give an excellent edge and sharp skills. The hardness of the blade of this knife is HRC 58-60 in the laboratory and was sharpened by hand on a sharp edge. hands of durable high quality leather sheath included cow leather. Purchasing you must be sure and certify that you are 18 and you are able to legally buy and hold an item and use responsibly. Handmade , Forged Damascus Steel (1095 / 15N20) . Hands of durable high quality leather sheath included cow leather.